From the time of independence, Jute industry of India confronted many problems and jute mills hardly operate to their optimum capacity. This happened as most of the raw jute producing area went over to Pakistan and lack of modernization of jute products developing plants & machinery. But, with the threats of global warming, every country of the world is promoting use of jute made products so as to contribute towards the protection of environment. Today, one can see a wide variety of jute made items from bags, carpets, furniture, clothing to storage boxes. Talking about jute made storage boxes, these are developed by tightly binding jute sticks with the help of threads. Jute storage boxes are widely used in the market for packaging and storing variegated goods in a secure and attractive way. In the era of cutthroat competition, every storage boxes manufacturer wants to be the prime choice of customers. Due to which, he/she offers its range of jute storage boxes in variegated standard sizes, shapes, designs, patterns and color shades. Firms are also offering facility of designing and developing storage boxes made up of jute as per the drawing or details provided by the customers. While choosing the jute storage boxes, one must keep the size of their goods to be packaged or stored in mind as too much large or small size may make feel regret for purchase. Jute storage boxes are attractive in looks and hence are used in the market for a variety of purpose from, packaging to storing. These packaging boxes are widely demanded by several cosmetics, handicrafts, show pieces and delicate items manufacturers for providing an appealing packing to their offerings. 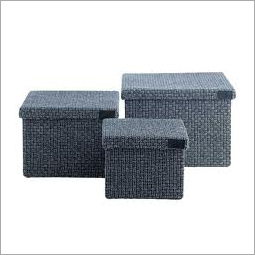 Due to lightweight and ability to bear weight, jute storage boxes are extensively appreciated and used by variegated industries, across the world.